PARENTS PED DAY: The Central Parents Committee of the English Montreal School Board will hold a special one day workshop on a variety of topics of interest on Saturday, April 29 (8:15 am to 4:15 pm) at the St. Laurent Adult Education Centre (2405 Place Lafortune) and LaurenHill Academy Junior Campus. Both schools operate under the same roof. This “Parents Ped Day” is open to all parents whose children attend the EMSB. Registration spots are still available. Workshops will focus on a broad range of topics including: STEAM (Science, Technology, Engineering, Arts and Mathematics), digital citizenship, social media, online lives of students, transgender and LBTQ issues, the new sexual education program, physical activity, math programs, literacy skills, getting children on proper bedtime routines, demystifying the Individual Education Plan (IEP), raising a child with special needs, helping children develop strong oral language and early literacy skills, taking the stress out of elementary school, managing anxiety, supporting students with fine motor difficulties, keeping our kids safe in the digital world, the great debate about homework and vocational education. The sessions will be facilitated by EMSB professionals who have expertise in these specific areas and other highly qualified professionals. This conference is being organized by the EMSB Central Parents Committee, its Chairman Suzanne De Jonge and parent commissioner Norm Gharibian. There is no registration fee for this program. This conference is geared towards anyone who has an interest in the EMSB community. As a parent, a teacher, a volunteer or as the parents of interested future students, there is something for everyone! Register here. Registration is limited and accepted on a first come, first serve basis. TAPE A TEACHER: Lester B. Pearson High School’s Student Council recently held its third annual Tape-A-Teacher fundraiser. Lengths of tape were sold to students and Governing Board Chairperson Benny Berneti. Teacher Mr. Nasiek and student teacher Mr. McAlpine were taped to the columns of the plaza area. All proceeds of the event benefitted the school`s “We Villages” campaign as they support Education in Rural China and Healthcare in Haiti. GREEN CORRIDOR: The City of Montreal, the Montreal North Borough, the Société de verdissement du Montréal métropolitain (Soverdi) came together at Lester B. Pearson High School to announce $500,000 in funding for the Green Corridor Project from TD Bank. The funds will be used on a new soccer field, track, basketball nets, public art and more greenery. The Green Corridor Project includes both Lester B. Pearson High School and Gerald McShane Elementary School. Mayor Denis Coderre, Borough Mayor Christine Black and officials accept the generous cheque. The EMSB was represented by: Sylvia Lo Bianco, Vice-Chair; Evelyne Alfonsi, Regional Director, East Sector; Joe Vittantonio and Sabrina Petrocco, Principal and Vice-Principal of Lester B. Pearson High School; Christina Chilelli, Principal of Gerald McShane Elementary School and Diana Nguyen, Assistant Director, Material Resources. Here are some photos. GOAL INITIATIVE: Grade 6 students from Leonardo Da Vinci Academy in RDP recently visited Lester B. Pearson High School to be students for a day as part of their GOAL initiative. LDVA students took part in a mini-high school experience, attending science, art and physical education classes alongside Secondary V students who participated as chaperones and also debriefed the variety of activities at the conclusion of the day. Director General Ann Marie Matheson, Breakfast TV hosts, Tyfanny Coryn and students congratulate the teachers. NATIONAL TEACHERS DAY: On the eve of National Teachers’ Day, which falls on May 2, the EMSB recognized three teachers with special awards from P.F. Chang’s and La Cage Brasserie Sportive. The ceremony took place on April 26 at Roslyn Elementary School and was co-sponsored by City’s Breakfast Television. On air personalities Derick Fage and Catherine Verdon Diamond served as emcees. 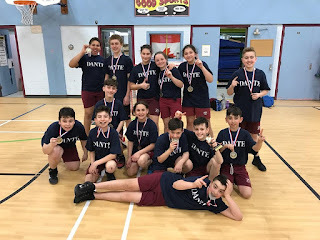 The EMSB received many nominations for the awards, which fall into three categories: youth sector, adult sector and physical education and health. Tyffany Coryn, the hospitality manager at PF Chang’s Montreal, presented $100 gift cards to Roslyn kindergarten teacher Nancy Latulippe, John F. Kennnedy Adult Education Centre in St. Michel English teacher Stuart Chappell and a $100 gift card to La Cage to Hampstead Elementary School Physical Education and Health teacher Michael Creamer. For the complete press release click here. Marianne Davis at her reception last December. Kattam is welcomed to St. Gabriel. KATTAM AMD TAM TAM: In celebrating multiculturalism, St. Gabriel Elementary School in Pointe St. Charles welcomed musician “Kattam et ses Tam Tam.” Kattam took students on an interactive musical journey from Africa, to the Middle East and India. Students learned all about the unique instruments of each region in a fun-filled way. This musical journey showcased not only the diversity of each group but the similarities of each group. This multicultural appreciation and understanding was transmitted to the students through rhythm, costumes, and comedy! This fantastic show was organized by Spiritual and Community Animator Veronica D’Agata. Marymount staff and students and Spiritual Animation Coordinator Frank Lofeodo with Mayor Coderre. 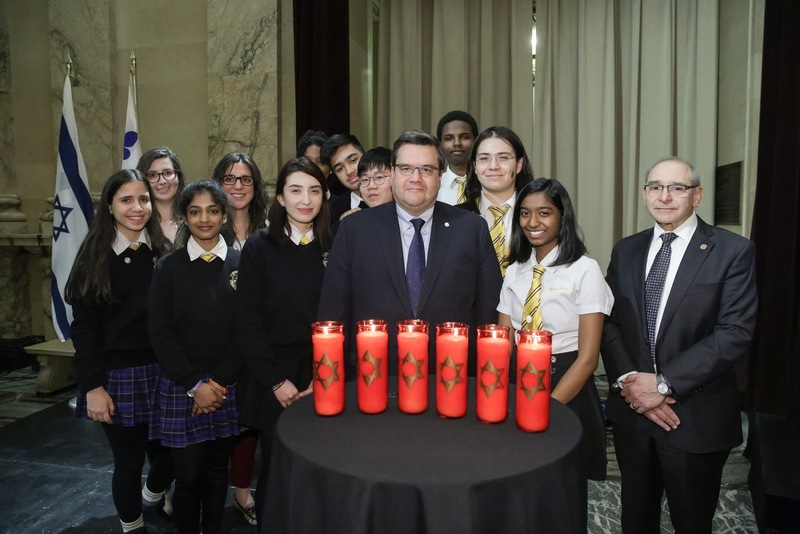 YOM HASHOAH: Students from Marymount Academy International in NDG attended a special Yom Hashoah Holocaust Remembrance ceremony at Montreal City Hall on April 24, presided over by Mayor Denis Coderre. Students Beniel Dubé and Sofia Gerena Monroy were asked to light candles. Montreal is the only city in Canada where the mayor presides over such a ceremony. There were speeches by Mayor Coderre, members of city council, the Consul General from Israel and Holocaust survivor Sidney Zoltak. See this story in The Gazette. AMBASSADORS OF CHANGE: About 45 students from the EMSB will travel to Ottawa on May 8 to remember those who perished during the Holocaust, as well as to increase their awareness of the values associated with diversity, justice and social inclusiveness at two events: the annual Ambassadors of Change Symposium and the National Holocaust Remembrance Day Ceremony. The students – along with school staff and spiritual community animators (SCA) – represent John Grant High School in Côte Saint-Luc, Outreach Alternative High School in NDG, Programme Mile End Alternative High School in Côte des Neiges, and LaurenHill Academy in St. Laurent. Organized by the Canadian Society for Yad Vashem, the day-long event will be divided into two parts. First, about 150 students from Quebec and Ontario will meet at the National Arts Centre from 1 p.m. to 2:30 p.m. to participate in the Ambassadors of Change Symposium. They will take part in guided group discussions, in which groups of 15 students each will be paired with a Holocaust survivor. The survivor will share their respective firsthand Holocaust experiences in their assigned groups, as the students – with the help of 15 provided questions – will facilitate discussions on the relevance of the lessons that the Holocaust has taught in today’s world, as well as how they can help promote a sense of tolerance and inclusiveness in their own communities. The event continues at 3:30 p.m. at the Canadian War Museum, with the National Holocaust Remembrance Day Ceremony. The students will join a gathering of about 600 people, including survivors and their families, as they take part in a ceremony that helps to keep alive the memory of the Holocaust and the six million Jews who tragically died at the hands of the Nazis, and to instill the values of respect for human rights around the world. A number of VIPs and dignitaries are expected to attend the ceremony. They include Prime Minister Justin Trudeau and Ottawa Mayor Jim Watson, leaders of the major federal political parties, Members of Parliament, senators, ambassadors, justices from the Supreme Court of Canada, and Israeli Ambassador to Canada Nimrod Barkan, who will deliver the keynote address. See this complete press release. It was a moving ceremony at Royal West. 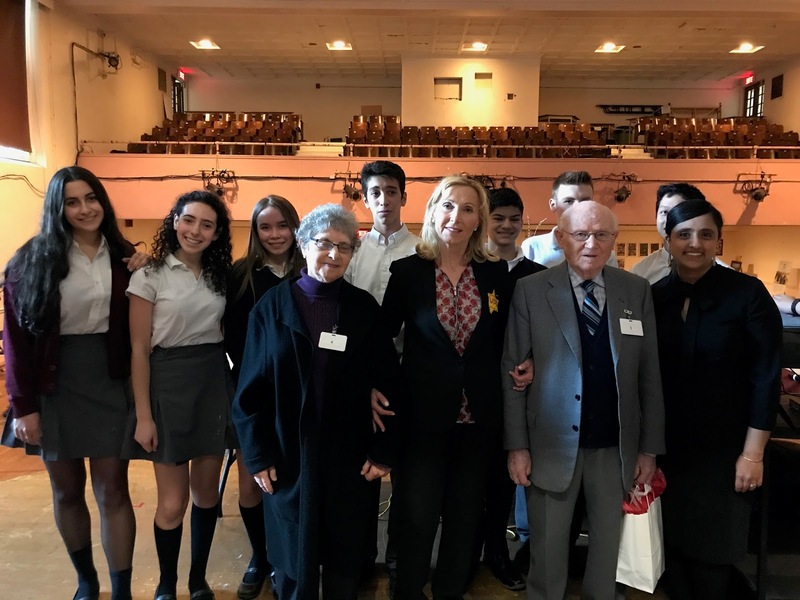 SERVICE AT ROYAL WEST: In commemoration of Yom Hashoah, students at Royal West Academy had the honour to meet with two survivors and hear the story of a third, Ann Kazimirski, through the presentation of her daughter, Heidi Berger. Following the presentation, students lit six candles in honour of the six million Jews whom were murdered at the hands of the Nazis as well as observed a moment of silence and reflection. Marymount students learn about Vimy Ridge. VIMY RIDGE: On April 4, Marymount Academy International’s Grade 11 students were invited to commemorate the 100th anniversary of the Battle of Vimy Ridge (April 9, 1917) with the presentation of “Regiments on the Ridge: 100 years after the Battle of Vimy Ridge” at Victoria Hall. The battle of Vimy Ridge was a defining moment for Canada, as the country demonstrated superior military skill and success on a world stage. In April 1917, the Canadian Corps, fighting for the first time as a Canadian entity, attacked the ridge which spanned seven kilometers and was heavily fortified. The French and British had previously attempted to take the ridge but failed with massive casualties - but the Canadians were successful and forced a major German retreat. Their victory came at a great cost: 3,598 Canadians were killed and more than 7,000 wounded. Amongst these men were 98 RMR soldiers dead and 176 wounded. Both students and staff members were moved by the celebration and truly enjoyed the exhibition. This educational and memorable event was a great way to commemorate the brave Canadian soldiers who fought so successfully to take Vimy Ridge. ANNUAL FILM FUNDRAISING EVENT: This year, the Centre for Child Development and Mental Health of the Jewish General Hospital, an EMSB program, will hold its annual fundraising event at Mega-Plex Sphèretech 14, Cinémas Guzzo ( 3500 Côte-Vertu ) on Wednesday, May 17 with a screening of the film Hunt for Wilderpeople. It is about boy and his foster father who become the subject of a national manhunt after being on the run in the New Zealand bush. It stars Sam Neill and premiered at the Sundance Film Festival. Tickets are $36 (tax deductible) and includes popcorn and a drink. Cheques can be made out to the JGH – Child Psychiatry Fund For tickets contact Anita at (514) 340-8222 Ext. 25638. Marc Garneau joins Junior Robotics winners. 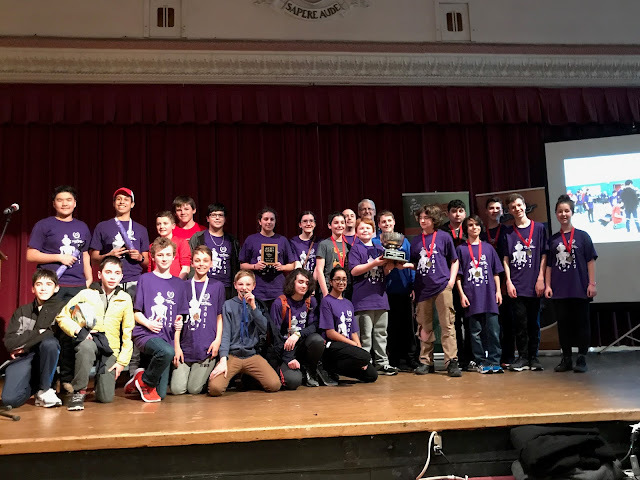 JUNIOR ROBOTICS: More than 90 teams from 23 schools and 370 students competed in the 15th annual Junior Robotics Competition April 21 and 22 at Royal West Academy in Montreal West. The Honourable Marc Garneau, Minister of Transport and MP of NDG-Westmount, served as the keynote speaker for the awards ceremony. 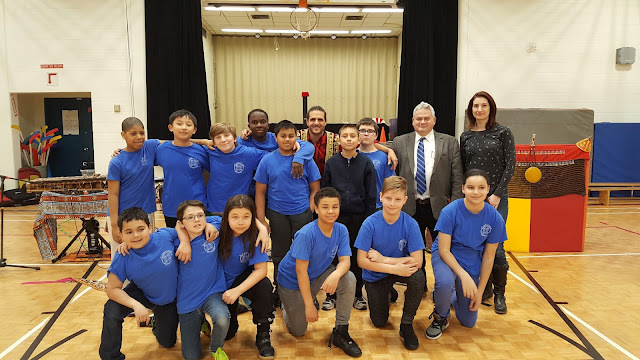 This annual competition featured 16 EMSB schools, allowing for the teams to compete in four events: Soccer 2-on-2, Search & Rescue, OnStage, and Triathlon. Representing the EMSB were: Bancroft Elementary School and M.I.N.D. High School in the Plateau, Cedarcrest Elementary School and Gardenview Elementary School in St. Laurent; Coronation Elementary School in Côte des Neiges; Dalkeith Elementary School in Anjou; Merton Elementary in Côte Saint-Luc; Focus Alternative High School in NDG; Edinburgh School, Elizabeth Ballantyne Elementary Schools and Royal West Academy in Montreal West; General Vanier Elementary School in St. Léonard; Our Lady of Pompei Elementary School in Ahuntsic; Pierre Elliott Trudeau Elementary School in Rosemount;, Royal Vale and St. Monica Elementary Schools in N.D.G; and Vincent Massey Collegiate in Rosemount. “What an electrifying atmosphere it was!” stated event coordinator Nijad Dahdah. “Royal West Academy proved once again to be a great host for the Junior Robotics Competition. All the main floor of the school was open for the use of the students; three gyms, the auditorium and the cafeteria. The RWA administration, staff, and many student volunteers did a fantastic job during the event and the days leading to it.” For the complete results click here. ROBOCUP INTERNATIONAL: The RoboCup International Event will take place at the Palais des congrès de Montréal. The venue has been reserved for this International event from Friday, June 15 to Friday, June 22, 2018. Approximately 5,000 participants, students and mentors from 30 different countries are expected. Gardenview students served up success. 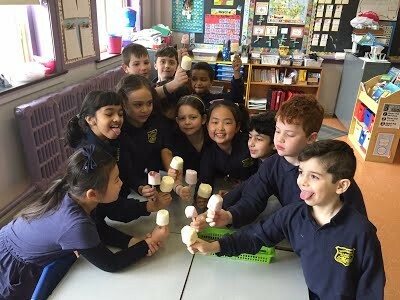 HEALTHY BODY, HEALTHY MIND: Gardenview Elementary School always strives to promote healthy and mindful eating and Nutrition Month was filled with many different classroom activities. The month culminated in a Snack for Charity Fundraiser in Ms. Furtado’s class. 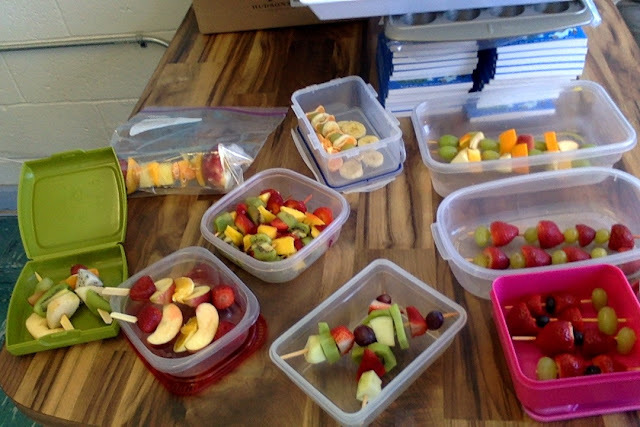 Nutrition is a key contributor to good mental health so the class provided a healthy array of treats available to Grade 6 students and raised over $500 for AMI-Québec, a grassroots organization dedicated to helping families cope with the effects of mental illness. For more information, you can visit their website at www.amiquebec.org. LEADERSHIP LUNCH: The Gardenview Elementary School Leadership Committee is composed of Grades 5 and 6 students who have the responsibility of leading their school by example. 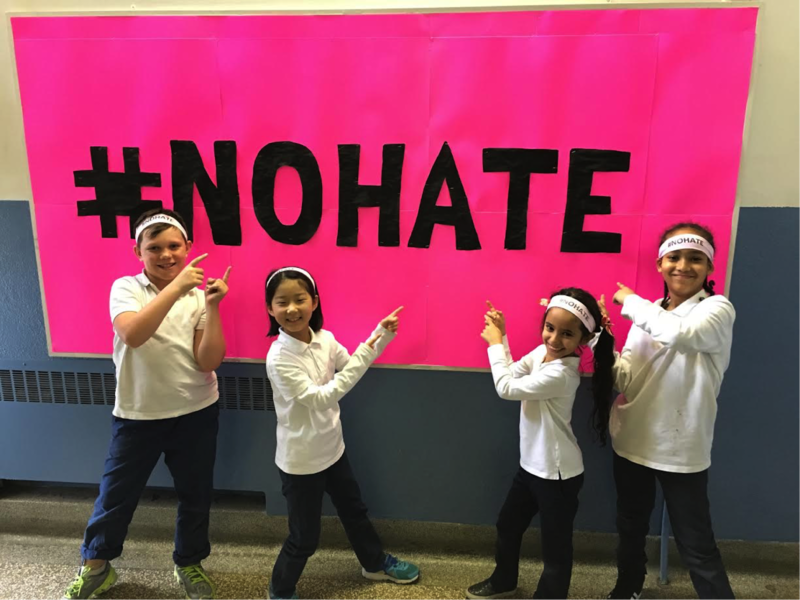 Throughout the year, they have been organizing various school-wide events in order to promote respect for their community and their school, as well as raise money for the Montreal Children's Hospital. During the month of April, Earth Month, the Leadership Group organized a multicultural luncheon in honour of the different cultures in their school and in their city. Cycle 3 students had the opportunity to sample foods from all around the world and learn about different cultures. During this event that broadened the student's understanding of the world and their neighbors, $750 was raised and donated to the hospital. Hanorah, Angelike Falbo and David Marino with the EMSB's Evelyn Alfonsi and Pela Nickoletopoulos. FRENCH FOR THE FUTURE: FACE School was the site for the 2017 French for the Future Montreal Local Forum on April 6. Aimed at promoting bilingualism amongst Canadian youth, the theme of the annual French for The Future Conference was Respect, Culture and Integration into Québécois Society. Approximately 500 students from eight Montreal high schools from three school boards and two Jewish day schools were present. Charismatic Montreal comedian Dorothy Rhau served as master of ceremonies. FACE is the only school jointly run by the EMSB and the Commission Scolaire de Montréal, making it a logical choice to host this conference. There was a musical performance by the group NBGN, starring RACCOON and a special presentation by Maude Morisette, a comedian and the creator of the award winning web series La Dump/The Dump. Other activities included an interactive quiz on Canadian and Quebec culture, a francophone youth contemporary and hip hop dance group, Urban Element Zone, a homemade rendition of TVA’s La Voix and the always much anticipated interactive finale starring the entertaining Ligue D’improvisation Montréalaise. Students celebrate the success of their La Voix performance. The event concluded with some exciting prizes presented by local sponsors (Bureau en gros, HMV, EMPIRE, Renaud Bray etc.). The La Voix segment was particularly popular. Angelike Falbo, a runner up in 2015 and a grad from Laurier Macdonald High School in St. Laurent was joined by present day competitors David Marino and Hanorah. Marino is a grad of the EMSB’s Leonardo Da Vinci Academy and Vincent Massey Collegiate. The trio acted as judges, with their chairs turned to the back of the stage as about a dozen students bravely came to the stage to sing for them. Participating schools at the conference were Westmount High School, Royal West Academy in Montreal West, Royal Vale in NDG, John F. Kennedy High School and FACE from the EMSB; Lakeside Academy in Lachine, Lindsay Place in Pointe Claire from the Lester B. Pearson School Board; Howard S. Billings High School in Chateauguay from the New Frontiers School Board; and the two Jewish high schools – Bialik and Hebrew Academy. See the Breakfast TV coverage. See this column by Allison Hanes in The Montreal Gazette. Royal West staff and students at the dealership. WE MOVEMENT: Students at Royal West Academy, along with their Spiritual and Community Animator Jagdeep Trehin, have been at the forefront of the We Movement all year long. 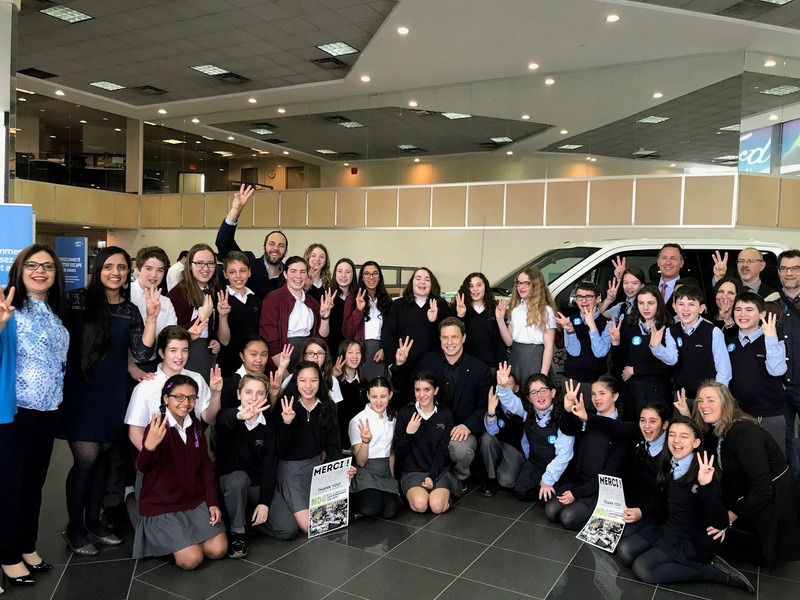 Their efforts were recognized recently by Marc Kielburger, co-founder of Free the Children at a ceremony at Ford Lincoln Gabriel on St. Jacques Street. Leading up to the ceremony, students organized a number of events at Royal West Academy to raise awareness and funds for the We Movement. Furthermore, as apart of the We Scare Hunger campaign, students collected one ton of food which will be donated to the NDG Food Depot. The Strike Out Cancer Fund raises awareness towards this type of cancer and helps support the individuals as well as the families who are affected by this illness. Next on the agenda is the seventh annual StrikeOut Cancer Bowl-a-thon on Sunday, May 28 ( 1 pm to 7 pm) at Centre de Quilles 440 (2535 boul Curé-Labelle) in Laval. The goal is to raise $10,000 as part of a partnership with the Children’s Wish Foundation. In this case, the wish child is named Sophie. She is an eight year old battling bone cancer. “We continue to strive and expand in order to help our community and reach our goal of making another young child's wish come true,” said Anthony, who was accompanied to the classrooms by his friends Alessia Ferrara and Damiano Dattilio. Tickets for the Bowl-a-thon are $35 for adults and $25 for children aged 12 or younger. This includes three games of bowling plus shoes, food and drinks and door prizes. You can find the sign up link to the event here. You can also log on to www.strikeoutcancerfund.org. ANIMAL WELFARE AT LHA: Students in Grade 9 at LaurenHill Academy were asked to choose a topic they were passionate about, and then persuade their peers during Public Speaking Month at school. Cecilia, Gabriella, Samantha, Melina, and Antonia all chose to teach their classmates about the importance of living a Cruelty Free lifestyle for all living beings. After having moved their classmates and teachers with such an important, compassionate, and educational topic, they agreed to collaborate with Paws Angels to get their message across! A huge thank you to Cecilia, Gabriella, Samantha, and Vanessa for your compassionate collaboration! See this excellent video. EMSB TEACHER WINS FEDERAL BY-ELECTION: In what political pundits are calling an astonishing victory, Rosemount High School teacher Emmanuella Lambropoulos captured the Liberal Party nomination for the federal riding of Saint-Laurent-Cartierville, upsetting former Member of the National Assembly and Quebec cabinet minister Yolande James as well as Mawhra Rizqy. She subsequently won the federal by-election and is now a Member of Parliament.Ms. Lambropoulos, a lifelong resident of Saint Laurent, attended Gardenview Elementary School and LaurenHill Academy before pursing a career in teaching. Jason Rockman brings Comiccon to his old elementary school. ROCKMAN RETURNS: CHOM FM radio host Jason Rockman returned to his former elementary school, Willingdon in NDG on April 21to talk about his career in broadcast media and the upcoming ninth edition of Montreal Comiccon. Jason Rockman, the host of Amped with the Rockman weeknights on CHOM FM, is also the lead singer of Slaves On Dope, a Montreal scenester and a huge supporter of local bands trying to make it big. His show consists of hits songs from classic rock to indie. Mr. Rockman is also the official spokesperson for Montreal Comiccon, which expects to attract more than 60,000 people to the Palais des congrès from July 7 to 9 to celebrate their shared passion for pop culture. Joining Mr. Rockman were some cosplayers dressed up for the visit, impersonating a galaxy of famous characters. The EMSB will have an information booth at Montreal Comiccon for the second year in a row. Mr. Rockman speaks on behalf of Montreal Comiccon in both English and French. He credits his bilingualism to the French immersion program he went through at Willingdon. TROTTIBUS TO DEBUT: Willingdon will launch the Trottibus Walking School Bus program, an initiative of the Canadian Cancer Society, on Friday, May 5 (8:55 am). This pedestrian bus allows elementary school children to walk to school safely through planned routes, and under the supervision of screened volunteers. Students reap the healthy benefits of walking as opposed to taking the school bus. Benefits include more physical safety, less traffic around schools, increased pedestrian safety and less pollution. Willingdon will become the second EMSB school to participate in the Trottibus initiative following Dunrae Gardens in TMR. Willingdon Physical Education and Health teacher Lara Belinsky and a group of dedicated parents have been working hard to start a Trottibus at Willingdon. It is being launched with two routes on Friday mornings only right now. Those who wish to participate can log on to http://www.trottibus.ca/en/participate, The Canadian Cancer Society created Trottibus six years ago for many reasons, including increasing the level of daily physical activity, lowering the risk of cancer, easing traffic around the school, greener neigbourhoods, and more. On their website, they state that around half of all cancer cases can be prevented by adopting a healthy lifestyle and the implementation of policies to protect public health. In addition, they remark that each kilometre covered on foot on a daily basis is associated with a five percent decrease in the probability of becoming obese. WILLINGDON MTL 375: Bees, bikes and benches are all the talk at Willingdon in N.D.G. as the school was selected by Youth Fusion to create a special urban orchard in honour of Montreal’s 375th anniversary. The multi-disciplinary project, which will be built on the Draper side of the school, combines elements of urban planning, history, science and art that will culminate in a unique new addition to the community. Grade 6 students and six teachers have been involved along with science specialist Dr. Kathleen Usher and the Urban Planning student Myriam Fakhri who are jointly coordinating the project. The team has mapped out, surveyed, modeled, designed the site, as well as selected the bench and bike rack designs. In the coming weeks, students will also research and plant the apple trees and along with well-known artist Guilaume Lavoie, will paint the mural. Throughout the process, students met with residents to solicit ideas for the urban orchard. One such idea was to include benches; this came as a result from a meeting with the N.D.G. Senior Citizens Council.To encourage the re-birth of N.D.G.’s agriculture, also present at the urban orchard will be a beehive, provided by Alvéole. The hive will be installed on the roof of Willingdon and the bees are expected to pollinate the apple trees as well as the school’s existing vegetable garden. SAM ROBERTS ROCKS: Willingdon is fortunate to have a celebrity parent in recording artist Sam Roberts and he recently graced the stage at the school's annual spring concert. His daughter played an exceptional violin as well. Nick DePuy gets a grand welcome. IMPACT VISIT: Nick DePuy is one of the newest additions to the Impact, selected in the first round (19th overall) of the 2017 MLS SuperDraft. He made his professional debut on March 4, 2017, as an 83rd-minute substitute during a 1-0 loss to San Jose Earthquakes. Willingdon students were thrilled to meet him. Click here for more photos. Magali Harvey is welcomed to Royal Vale. JUMP ROPE FOR HEART: Royal Vale’s annual Jump Rope for Heart was held recently where students welcomed a number of celebrities, including Team Canada’s Magali Harvey. Harvey was named the International Rugby Board Women’s Player of the Year in 2014, the first Canadian to receive this distinction. She won a gold medal at the 2015 Pan American Games along with the Canadian Rugby Sevens team. CBC Montreal’s Debra Arbec, actress Stephanie Janusauskas and former professional soccer player Lloyd Barker also participated in the event. JAMES LYNG REUNION: James Lyng High School (5440 Notre Dame Street West), which opened its doors in 1967 to serve English-speaking Catholic students from across southwestern Montreal, is celebrating its 50th birthday with a massive Homecoming gala at the St. Henri school on Saturday, May 20 (6pm). From its start in Canada’s Centennial Year, JLHS has brought the best out of thousands of youths from the Côte St. Paul, Griffintown, Point St. Charles, St. Henri, St. Raymond’s, and Ville Emard districts. More than 1,000 people from around the world are expected to join the Homecoming party at the school. Tickets cost $40. The event will feature an array of fine food, numerous cash bars, and the hottest dance music from the ‘60s to today. See the press release. BATTLE OF THE BOOKS: Students from LaurenHill Academy in St. Laurent, MacDonald High School in Sainte-Anne-de-Bellevue, and Azrieli Schools Herzliah High School in Montreal faced off in a test of their literary knowledge at the “Ultimate Battle”, the finale to the second annual “Battle of the Books” competition. The MacDonald High School team of the Lester B. Pearson School Board (LBPSB) was the clear winner, finishing 50 points ahead of the competing schools. The final event took place on Tuesday, April 25 in the Laurence Patterson Room of the English Montreal School Board (EMSB) Administration Building in NDG. 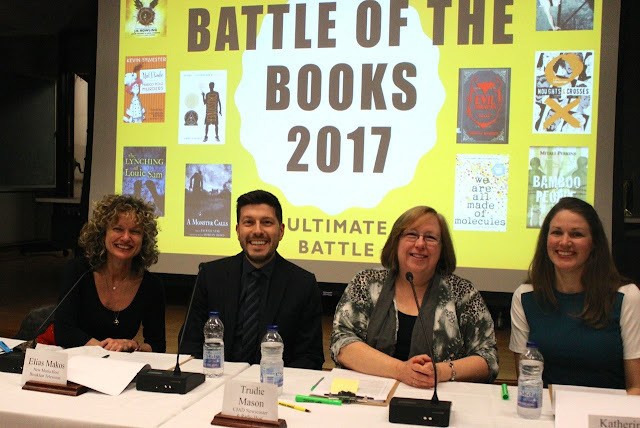 Organized by the EMSB’s Education and Technology Services (ETS), “Battle of the Books” tests the teams’ detailed knowledge of 10 pre-selected young adult books that the students have read prior to the competition. Some of this year’s titles include Marco Polo Murders by Neil Flambé, Learning the Ropes by Monique Polak, and Bamboo People by Mitali Perkins. The “Ultimate Battle” brought winning teams together from the EMSB, the LBPSB, and the Quebec Association of Independent Day Schools. The competition consisted of two rounds of four questions per team and two “lightning rounds”, where teams gain points for each correct answer. Congratulations to the MacDonald High team, and in particular their spokesperson Kathryn Patterson, who fired answers off with impressive speed and accuracy during the lightning rounds, earning a remarkable final total of 134 points. Monique Polak, Elias Makos, Trudie Mason and Katherine Hanz. Special “Ultimate Battle” guest judges included Elias Makos, host and producer of Breakfast Television; Trudie Mason, CJAD newscaster and radio host; Katherine Hanz, librarian at McGill University; and Monique Polak, teacher, journalist and author of books for young adults. Master of Ceremonies Nicolas Doyon of the EMSB’s ETS Department kept the event on track and entertained the full house of cheering parents and school administrators with his humour and quick wit. The EMSB’s ETS Department thanks CBC Canada Reads, Drawn & Quarterly, Livres Babar and Librairie Paragraphe for supporting this event. 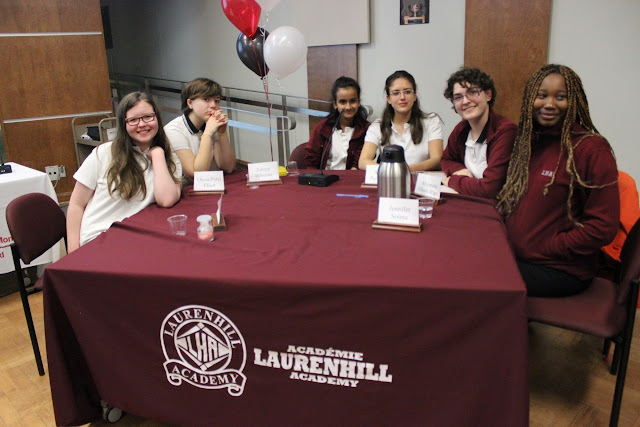 Students from LaurenHill Academy, Vincent Massey Collegiate in Rosemount, Westmount High School and Royal West Academy in Montreal West faced off in a head-to-head test of their literary knowledge, as the EMSB held its ow second annual “Battle of the Books” competition on April 19. EMSB Librarian Paul Grewal notes that “Battle of the Books” is a fun and engaging way for students and their families to get excited about reading, while also building confidence and teamwork skills. See this coverage on Breakfast TV. PUBLIC SPEAKING:The EMSB’s most dynamic communicators once again took to the podium at the 2017 Public Speaking Competition hosted by LaurenHill Academy (Senior Campus) in Saint Laurent. Secondary I and II students presented personal narratives while Secondary III-V students delivered persuasive speeches on topics of social and political importance. Secondary I and II winners will have the opportunity to present their winning speeches to the Council of Commissioners. 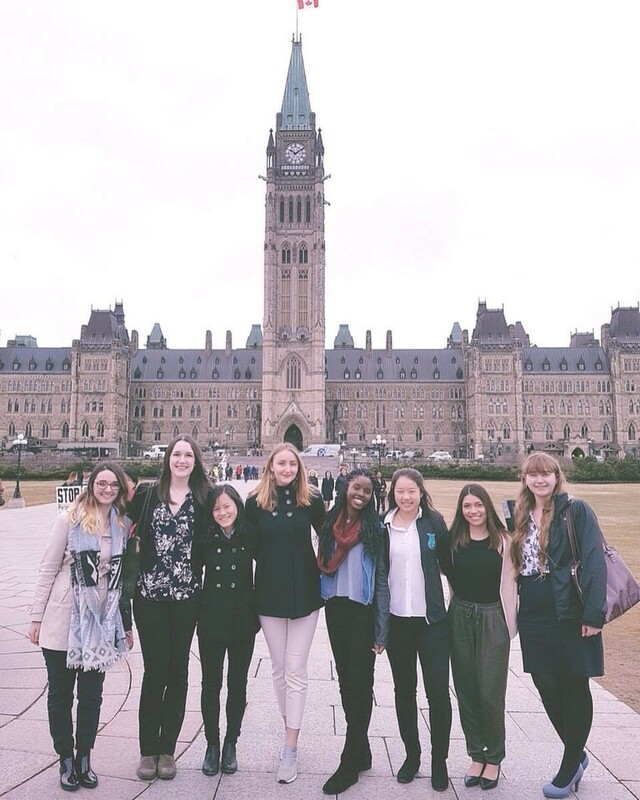 The Women’s Canadian Club awarded Secondary III winner Lisa Nguyen from Vincent Massey Collegiate with an all-expenses paid week to Encounters with Canada in Ottawa and an invitation to deliver her winning speech at their May meeting. 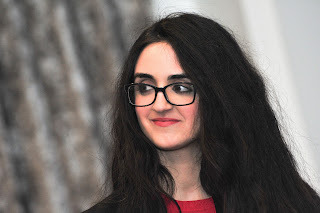 The Rotary Club of Montreal invited Secondary IV and V winners Romy Shoam from Royal West Academy and Geeta Tewari from LaurenHill Academy to their 77th annual Public Speaking Contest for High School students on Friday, May 12, which will be held during a luncheon at the St James Club. The awards are educational bursaries, paid to the college or university selected by the student. The winner's school will also host the RCM plaque. Amanda and her peers on Parliament Hill. ROSEMOUNT STUDENT AND MALALA: On April 12, a student from Rosemount High School, Amanda Chudobey-Berger, had an incredible opportunity to witness Malala Yousafzai receive her Honorary Citizenship in the House of Commons in Ottawa. Since Amanda is a youth ambassador for World Vision, she was selected and invited to attend this event via email, being only one out of two girls chosen from Montreal. Last Christmas, Amanda received Malala’s book as a gift, and since reading it she has been an inspiration and role model to Amanda. Malala speaks for the thousands of girls who are silenced. Back in October 2014, Malala was supposed to receive her Honorary Citizenship. However, due to the terrorist attack at Parliament, Malala was strongly encouraged to leave Canada for her safety. One of Malala’s friends was also with World Vision that day where he passed out cards to the youth ambassadors so they could write to Malala. 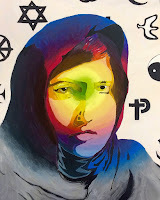 Not only did Amanda have the chance to write her a card, she was able to give her a copy of a painting she made of Malala in school, during art class. Amanda’s highlight of the day was hearing Malala’s inspiring words and getting to see her in person. She said: “The moment she walked into the room I was overwhelmed with emotions, tears came rushing down my cheeks, and my heart filled with joy and compassion.” Malala's message does not only speak to women, it speaks to the students of Rosemount High School and to the billions of other humans all around the world. They all resonate with us, so if you can follow her courage in pursuing equality and justice, you too can help make the world a better place for all. MONEY FAIR: On Tuesday April 18, John F. Kennedy High School’s Work Oriented Training Pathway (WOTP) program, in collaboration with The Canadian Foundation for Economic Education (cfee.org) and Scotia Bank, hosted its first annual Money Fair for Financial Literacy, in the same vein as CFEE’s talk-to-your-kids-about-money day. Students exhibited projects on a number of money-related issues. Kiosks were set up and run by students and includes the students’ individual projects, as well as some of the program’s recent entrepreneurship projects. There were also a number of retail items for sale as well as a kiosk selling snacks. TERRY FOX DAY: Eddy Nolan, a long-time caretaker at the EMSB, once again honoured the legacy of Terry Fox by leading a marathon along Sherbrooke Street West on Terry Fox Day on April 12. The latter is celebrated at the EMSB annually. Nolan, a cancer survivor, has been an ardent supporter of the Terry Fox Foundation for over 35 years. In 2016, he raised over $16,000 for the foundation. Despite being diagnosed with cancer six years ago, which led him to take a leave of absence from his job, Nolan has continued to be present at EMSB schools, educating students and raising funds. “All I try to do is spread Terry’s message to the children; that’s the most important thing to me,” said Nolan. “Terry is a true role model and a Canadian hero.” Cheering Nolan along the 42 kilometers were students from Westmount Park Elementary School, where he presently works.The students met Nolan as he ran past the Westmount YMCA. HEALTHY EARTH FAIR: Westmount High School (4350 Ste. Catherine Street West) is putting on a Healthy Earth and Healthy Living Fair hosted by the Secondary V ECHO (Ecological Choices and the Outdoors) class this Friday April 28 ( 1 pm) in the lobby. The school will be promoting the importance of finding creative ways to take better care of our earth and our health. Physical Education and Health teacher Karen Kleihauer says that the class has been growing tomato, kale, and basil plants, which will be on display for viewers to see. 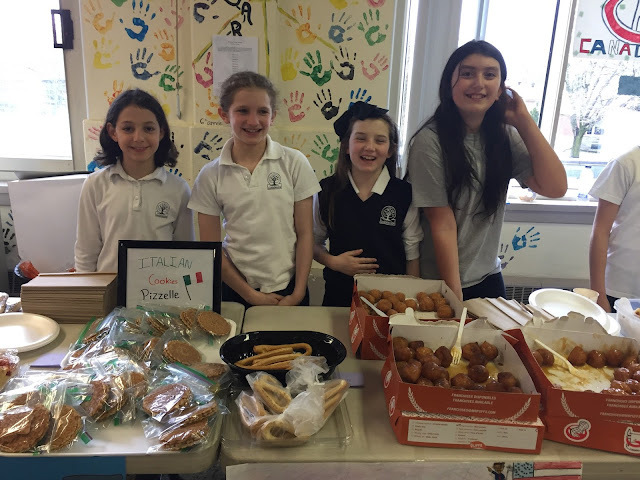 “The students have worked really hard putting this Earth Fair together and everything that they will be selling they have made themselves,” said Ms. Kleihauer. Items for sale will include smoothies, all dressed kale chips, apple cinnamon and zucchini chips, and natural lip balm. In addition, there will be a clothing exchange and Kombucha tasting. There is one terrific attitude at St. Monica. FUN AT ST. MONICA: Throughout March and April, students at St. Monica School in N.D.G. had several fun and educational activities that focused on themes of bullying, kindness and diversity. Teachers led classroom activities that taught skills on how to deal with bullying and how to create a positive environment where everyone feels safe, accepted and valued. Parents also had the chance to take part in a workshop held by Prevention NDG on how to communicate and deal with issues surrounding bullying. Capping off the theme of anti-bullying was a visit from the Montreal Alouettes’ Kyries Hebert, who spoke about how he overcame many obstacles in his life to get to where he is today. To conclude the month, students took part in a Zumba party and had the opportunity to show off their moves and celebrate their differences. To keep the spirit alive throughout the year, St. Monica set up a Peace Tree, where students will have the chance to add a leaf with their name on it if they are seen doing something kind or helpful. SIKH HERITAGE MONTH: Students from Edinburgh Elementary School in Montreal West marked Sikh Heritage Month at Concordia University recently with a morning of activities and learning. Alongside Spiritual and Community Animator Jagdeep Trehin, students visited an art exhibit, had the chance to sample a wide array of Sikh food as well as appreciate many other elements of Sikh culture and heritage. DANTE GIVES BACK: The students and staff at Dante School have embarked upon a fundraising campaign, having presented two musical presentations for the benefit of Corporation L’Espoir. This will allow students with special needs to enjoy a summer camp experience. The goal of this initiative is to give the children an unforgettable experience while providing support to families. Corporation L’Espoir assists children who are intellectually handicapped and on the Autism Spectrum. The two hour shows were very well received and features students from each grade singing tunes related to friendship. Even caretaker Sylvain Bonin took part in a song by the Grade 6 band Z Canoli and Friends – Let It Be From The Beatles. Sylvain was on guitar. Caroline Langevin, the director of Corporation L’Espoir, was touched by the show of generosity by the staff, students and parents of Dante. “To be here today to see children who will become adults of the future so open minded means the world to me,” she said. More than 700 people attended the two performances, raising more than $3,000.Info: http://corporationespoir.org. Ms. Frenette can be reached at elainefrenette@hotmail.com. Meanwhile, the Super Recyclers campaign at Dante has been a great success. 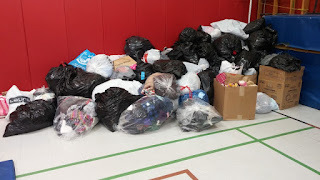 Dante families were encouraged to clean out closets at home and donate these items to the school. They will be recycled by Super Recyclers and Dante will receive funds for the school. It is a worthwhile cause in keeping with the school`s Brundtland philosophy. Dante students celebrated Earth Day by cleaning up their surroundings. Members of Ecoquartier St. Léonard presented each student, staff member and parent volunteer with a t-shirt and a pair of gloves. It was a festive afternoon at Dante School! The grounds are looking great! ECOMUSEUM VISIT: This year, Carlyle Elementary School was lucky enough to have been given the opportunity to visit the Ecomuseum Zoo. This wonderful field trip was only made possible with the support and contribution of FedNav and FCEC (Fednav Community Employee Committee). 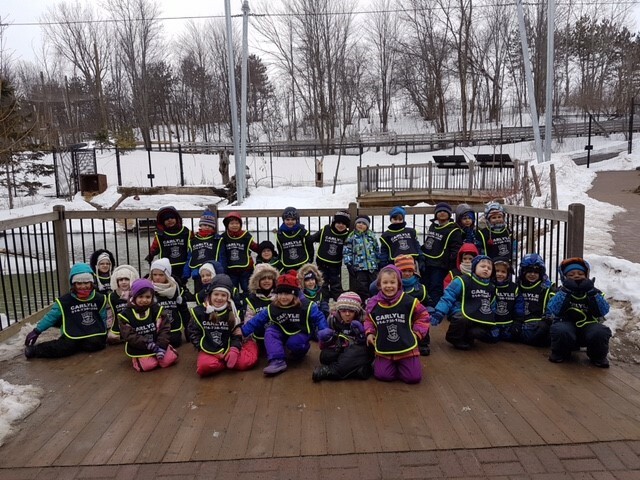 Their generosity provided busing as well as many wonderful activities that the students got to experience while at the Ecomuseum Zoo. The students' excitement was evident from the start of the very first activity. The animators were fantastic and provided many stimulating and educational activities. The students enjoyed seeing, as well as touching, some furry and scaly friends. 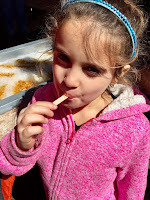 They were also thrilled to be zoo-keepers for the day and displayed a great deal of enthusiasm while preparing treats and toys that they fed to other animals in the zoo. They were also thankful to receive a final gift from FedNav, a hat from the Ecomuseum Zoo, as a reminder of their amazing field trip. POMPEI CONCERT: Our Lady of Pompei Elementary School recently held their annual Spring Concert. It took place at Leonardo da Vinci Centre in St. Léonard. The students had the opportunity to show their singing and music skills in front of over 400 guests including family, friends and School Commissioner/Vice Chair Sylvia Lo Bianco. Meanwhile, the school held its Family Day at the Sugar Shack.Over 100 students attended and were accompanied by their parents. Everyone had a good time throughout the day at Le Chalet des érables in Ste-Anne-des-Plaines, enjoying a traditional lunch and hoping in different rides. EBS GREEN TEAM: The fearless Green Team members from Elizabeth Ballantyne Elementary School in Montreal West have many environmentally friendly events planned this month. They have initiated a new fundraising campaign in collaboration with “Super Recyclers” (www.SuperRecyclers.com). Their motto is “JOIN THE GREEN SIDE.” They will be collecting any used clothing, linens, and footwear. Super Recyclers will pay 25 cents for each kilogram of clothing collected. The clothing is redistributed or, if necessary, recycled. Profits will go to EBS green initiatives. Meanwhile, the EBS annual schoolyard cleanup took place on April 21. With hands carefully gloved, students and staff members picked up all the garbage and made sure the schoolyard was tidy and safe! A Litterless Lunch was also planned for that day. Monday, April 24 marked the beginning of a ban on plastic water bottles. Students will be encouraged to bring reusable water bottles. LA SEMAINE DU FRANÇAIS: Starting with a breakfast of croissants et fromage and choosing French words to "wear," La Semaine du Français was a very busy time at EBS. There was partnership reading, a Scrabble competiton, chasse aux trésors, games and many different activities in every class. Students also learned about other French-speaking countries and created a video. The highlight of the week was a visit from the Cabane à Sucre – the students especially loved to have a chance to enjoy some sweet "tire!" MAKING EDUCATION MATTER: Make it Matter makes education matter. The organization will launch its initiative with a fundraising gala in support of St. Gabriel Elementary School in Pointe St. Charles, the EMSB and Inspirations Newspaper on Saturday, May 6 (8:30 pm) at Kandy Art Gallery in Montreal (5629 Ferrier). The funfair-themed Spring Gala fundraiser night at the modernly lavish Kandy Art Gallery will be a night to remember. Hosted by radio station 94.7 FM, the event will include lively entertainment, funfair attractions, open bar, appetizers, dessert buffet, and raffle prizes. Patrons can purchase tickets at www.makeitmattertoday.org. The “Funfair Fundraiser,” sponsored by a plethora of Montreal personalities and establishments, will raise funds for two special causes. Firstly, MIM will be supporting St. Gabriel Elementary school in Point St. Charles, an underprivileged, true community school which cherishes heritage while embracing diversity. Alongside, MIM will provide funding for Inspirations Newspaper, an invaluable resource that gives people with special needs a voice, and informs and connects parents, caregivers, teachers, students and the public to the special needs community.Founded in 2016, Make It Matter is a non-profit organization that funds project specific initiatives that support quality education for all learners. They believe that all learners are entitled to academic resources that will enhance their educational experience. MIM serves as the liaison between the Montreal community and the classrooms, where they are committed to creating a support system for administrators, educators, parents, and learners in need of financial assistance to ensure the success of every child’s education. Anthony Calvillo, Angela Mancini and Herb Zurkowsky of The Gazette. 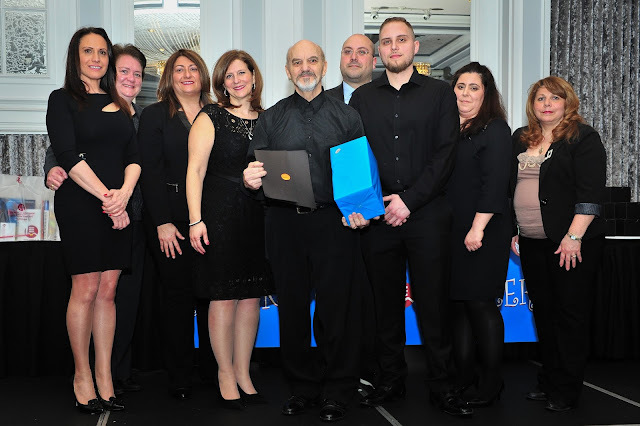 VOLUNTEER NIGHT: The annual EMSB Parent Volunteer Appreciation Evening took place on April 4 at the Crowne Plaza Hotel on Cote de Liesse and sponsored by La Capitale Financial Services. This year’s event was held to commemorate National Volunteer Week, which ran from April 16 to 22, under the theme of Volunteers –Part of Our Heritage. In recognition of Montreal’s 375th anniversary celebrations, Montreal Mayor Denis Coderre gave opening remarks. 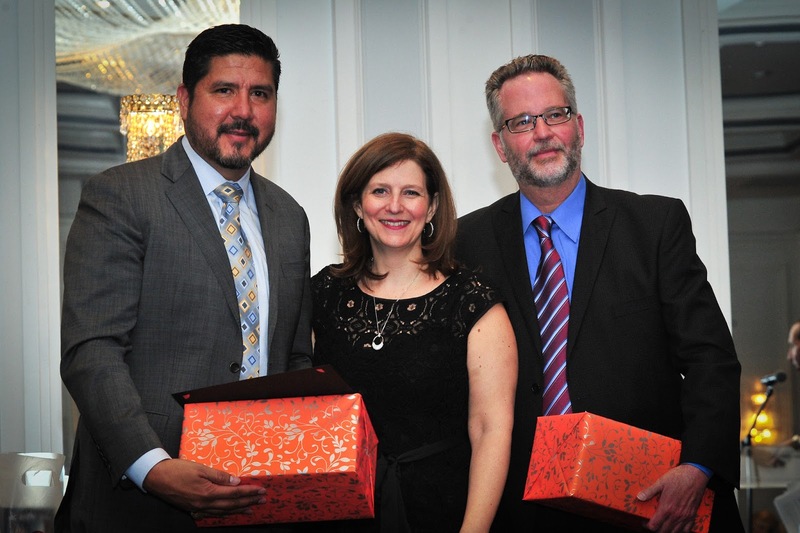 Football legend Anthony Calvillo, who had an outstanding career as the quarterback of the Montreal Alouettes where he is now an assistant coach, received the first ever EMSB Volunteer Ambassador of the Year Award. Anthony and his wife Alexia are the parents of two students at Gardenview Elementary School in St. Laurent. Over the past two decades, Anthony has graciously visited schools and shared his stay in school message with students. Rosario Guzzo and his son are honoured. Neil Janna meets all of your promotional supply needs. GET YOUR PROMOTIONAL SUPPLIES: Out of the 11 booth sponsors at this year’s Volunteer Appreciation Night, two of them were newcomers to the event. One of them was Fana Sports; the other was Hannah Promotions (www.hannahpromotions.com) , which is an agency that specializes in offering promotional products and strategies that help to impact overall growth objectives, with their main focus of contributing towards their clients’ overall profit and sales evolution. 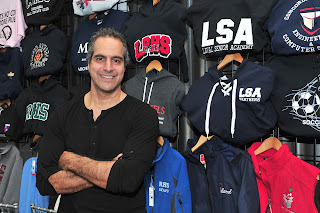 It joined veteran sponsors La Capitale, Steve’s Music Store, Green Apple Studios, Loft Uniforms, The Big Blue Hug, the Montreal Alouettes, KidCon and The Suburban newspaper. At their Volunteer Night booth, representative Neil Janna, who attended LaurenHill Academy in St. Laurent when it was known as Sir Winston Churchill High School, impressed the attendees with his display of the wide assortment of products that Hannah Promotions has to offer, from coffee mugs, pens and highlighters, to private and public school team sports and graduating class jerseys, polos, sweatshirts and hoodies. And for the past 30 years, Janna has moonlighted as a professional stand-up comic, and has performed in clubs, charity benefit shows and corporate gigs, not to mention numerous times at the Just For Laughs festival and toured around the world with the acclaimed performance troupe The Quiddlers. SPIRIT QUEST: On Thursday, April 20 students and Spiritual and Community Animators (SCA`s) and students of the EMSB took part in an event aimed at visiting sacred spiritual sites and experiencing compassion in action in order to further develop their spiritual awareness. According to First Nations traditions, one goes on a Spirit Quest with the hope of experiencing an inner change, a healing, and an openness to others and to the divine. There will be a number of links to Earth Day, including celebration of First Nations’ traditions of caring for the earth and for one another, at the launching of the Spirit Quest. The third EMSB-SCA Spirit Quest involved 12 schools - John F. Kennedy High School in St. Michel, John Paul I High School in St. Leonard, Laurier Macdonald High School in St. Leonard, Lester B. Pearson High School in Montreal North, Lauren Hill Academy Sr. and Jr. in Ville St. Laurent, Marymount Academy International in Montreal, Rosemount High School in Rosemount, Royal Vale High School in NDG, Royal West Academy in Montreal West, Vincent Massey Collegiate in Rosemount and Westmount High School in Westmount. Spirit Quest teams commenced their day-long journey at the EMSB Central Office at 6000 Fielding Avenue in NDG at 8:30 a.m. and concluded in mid-afternoo. at Beaver Lake on Mt. Royal. Students were tasked with completing a photo challenge, gathering information and were inspired to give back to their own community. Actions included honouring and visiting sacred sites and learning about the history of different cultural and faith communities in Montreal, visiting Mt. Royal for a time of reflection and sharing as well as taking care of our green spaces. One of the goals of the SCA service is to facilitate and encourage students to put into action their best self, and express their own positive virtues and character traits. This is the “Virtues Program” delivered by the SCA service that is the foundation of the EMSB/SCA Spirit Quest, representing a journey to deeper self-understanding. Each team consisted of a maximum of six students aged 12 to 16 and one SCA. They navigated a series of clues to get from one location to another by walking or using eco-friendly public transit, encountering spiritual challenges along the way. The Spirit Quest allows students to visit civic, historic, and spiritual and community organization sites while obtaining personal experience in developing positive virtues and character traits, strengthening the bonds of school-community relations as well as their intimate connection to the earth and their own spirit. NUTRITION MONTH RECAP: This year, thanks to many dedicated teachers and students who were hungry for nutritional knowledge, Nutrition Month was a huge success! A grand total of 12 schools, 30 classes and nearly 500 students participated to earn over 3600 points combined by completing nutrition-related challenges throughout the month of March. 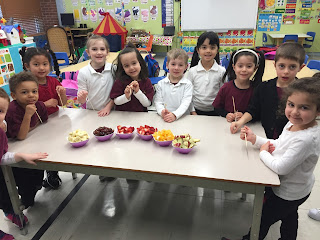 Students learned about the meaning of a balanced breakfast, how to increase the quantity and quality of their fruits and veggies, how to ensure they have healthy bones and finally about the best drink to drink: water! Classes also got creative and came up with some of their own challenges: they made overnight oatmeal, created their own healthy food guide, concocted their own cheese and wrote up a healthy grocery list on a budget! The classes that accumulated the most points per cycle division were: Melissa Roma’s Pre-K class (Gerald McShane), Nancy Latulipe’s Grade 1 class (Roslyn) and Nina Wong’s Grade 5 class (Gardenview). Their classes will be receiving a Culinary Workshop to reward their hard work. Meanwhile, Dalia Pardo’s Grade 5 class (Parkdale) won the IGA gift card!Congratulations to ALL the classes that participated! You were all incredibly impressive & creative and you are more nutrition savvy than ever! Make sure to stay tuned for next year’s Nutrition Month which will include new themes and challenges! HIGH SCHOOL NUTRITION: In high schools, the EMSB 2017 Nutrition Month Campaign was "March to Health - Are You Ready to Challenge Yourself to Become a Healthier?" To celebrate this event, high school teachers along with their students were invited to participate in educational activities and challenges to give students the knowledge and tools to make healthier food and beverage choices. A thank you to all those who supported our nutrition month initiative in promoting healthy lifestyle habits among our youth! Stay tuned for next year’s Nutrition Month Campaign! YOUTH FUSION VIDEO CREATION GALA: With the help of Fusion Jeunesse in the fall, students at Rosemount High School created a video game and now this work will be recognized at the Youth Fusion Video Game Creation Gala on Tuesday May 2 (3 pm to 7:30 pm) at Theatre Rialto (5723 Parc).Going over the pre-production, design and promotion of a new game, the fall presentation was packed with details. From its infancy stages to the later phase of the creation timeline, students were taken on a journey through the video game birthing process by two presenters: Michael Penta from Ubisoft and Charlène Boutin, from Fusion Jeunesse. Rosemount High School students are eligible for two awards at the Gala: Best Game and Perseverance. Should they win, they would be rewarded with either an activity day at Ubisoft Montreal or a draw for four spots in a video game creation summer camp, respectively. Every Stamp Has a Story. EAST HILL STAMPS McGILL PARTNERSHIP: Stamps have taken on a whole new meaning for Grade 4 students at East Hill Elementary School in R.D.P., as in partnership with McGill University Library, they have embarked on a project that delves into the history of stamps and the stories behind them. The highlight of the project was a visit to McGill’s McLennan-Redpath Library Complex on April 21 to see the Every Stamp Has a Story exhibition featuring items from the David Lank Collection, which at 50,000 stamps is the largest university philatelic resource of its kind. Entitled Every Stamp A Story, McGill University Library and East Hill School created a project that, based on Lank’s collection, invited students to choose a stamp that inspired them and create a story. 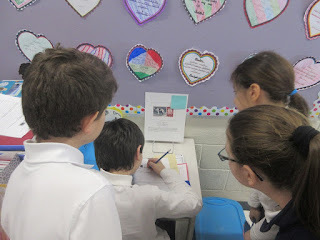 Beginning with research, which included the history of the stamp, the wildlife and the country of origin, students created their story, much like the original artists did through their artwork. On April 21, David Lank spoke to the students about his exhibit and personally gave them a tour of his collection. Following the tour, students attended a workshop given by Claudio D’Angelo, a renowned artist who has designed numerous coins for the Royal Canadian Mint, and painted images that have appeared on conservation stamps. He showed students a few basic techniques and guide them in designing their own wildlife stamps to help celebrate Canada’s 150th Anniversary of Confederation. See this Montreal Gazette story. EMSB IMPACT NIGHT: EMSB Impact Night will take place on Tuesday, May 28 (7:30 pm) at Saputo Stadium as part of the Amway Canadian Championship. Tickets, which are usually $33 each, are priced for EMSB families at a discounted $14 each. Some of the proceeds from ticket sales will go towards Inspirations, a publication dedicated to the special needs community. To purchase tickets, please click here. 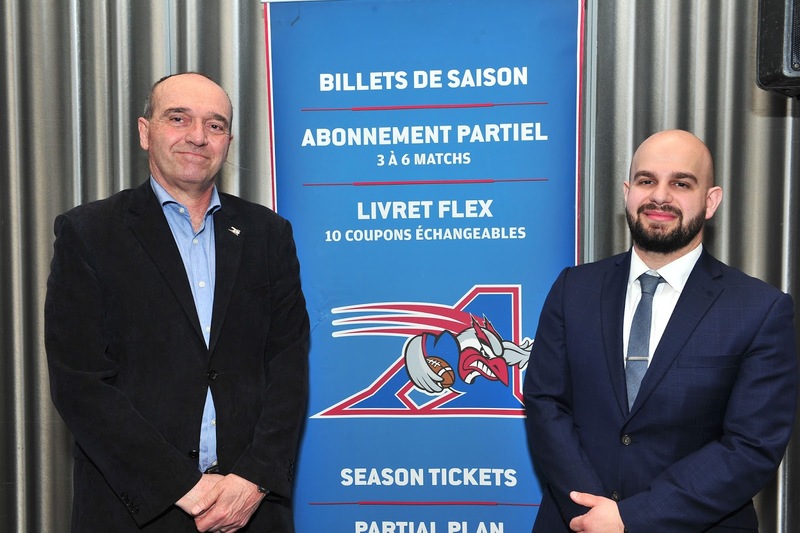 The Alouettes have special deals for schools. ALOUETTES FUNDRAISING OPPORTUNITY: The Montreal Alouettes will play their first regular season game on Thursday, June 22 at Molson Stadium against the Saskatchewan Roughriders and EMSB schools have a special opportunity to purchase tickets and use it as a simple fundraiser at the same time. Every school will be receiving a unique link and promo code. Parents and EMSB staff can print the tickets from their home or office. Anyone who wishes to do this the old fashioned way can call John Di Terlizzi at 514-787-2755 and he will handle the request. Tickets are $16 each, with $3 going back to each school. MERTON STUDENT TRIUMPHANT: Congratulations to Tiffanie Constantine, a Grade 5 student at Merton Elementary School in Côte Saint-Luc, who won a gold medal at Les Jeux De Montreal for a solo performance. In addition, her group of three girls won silver medals. She is with the Association Sportive Dynamo, Montreal. She previously won a silver medal at Les Jeux de Quebéc Gymmastique competition. Merton students receive their plaque from the Jewish National Fund. AWARENESS OF TREES: Students from the Jewish Heritage Program at Merton, along with the Jewish National Fund of Canada, recently planted 50 trees in Israel, marking the holiday of Tu Bishvat. The annual holiday is celebrated as an ecological awareness day and trees are planted as a traditional celebration. Students also prepared for the holiday of Passover. COOK FOR A CURE: Three EMSB schools (Nesbitt Elementary, Gerald Elementary and Rosemount High School) created an intergenerational recipe book that was launched at the “COOK FOR A CURE” evening. This intergenerational project is a multimedia, cross-curricular project designed to engage our students in writing, photography, and other activities as they research the history behind their family’s photographs and artifacts. After writing about their family member of their choice, they will share a family recipe which will be placed in the "Happiness is Homemade" cookbook. Proceeds of this year-long initiative will benefit the Montreal Neurological Institute for research and development in Alzheimer's research. Please refer to this video trailer or this website. The official book launch took place at Leonardo Da Vinci Centre on April 25. The audience was treated to a comedy performance from Joe Cacchione, a short presentation from Montreal Neurological Institute and the sharing of inspirational stories written by the students of Nesbitt, Gerald McShane and Rosemount. PROM QUEEN CONTEST: The Crown project is an organization located in Montreal. It provides assistance to men, women and millennials. Through various events, The Crown Project will be able to not only help those less fortunate, but also provide innovative ways to empower and uplift recipients and volunteers. The Prom Queen contest will provide a lucky young lady between the ages of 16 and 17 in high school with low income the opportunity to receive their prom dress, shoes, and accessories. While also being supplied services of hairstyling, manicure, pedicure and makeup application. Info: infocrownproject@gmail.com , call (514) 602-0852 . For more details log on to this link: http://www.emsb.qc.ca/emsb_en/pdf_en/media_en/flyer/2017-03-17-Prom%20Contest.pdf. DIVERSITY AND INCLUSION: The Critical Diversity in Higher Education (CDHE) research team at Vanier College cordially invites you to (Dis)Comfort Zones: Negotiating Tensions and Cultivating Belonging in College Classrooms in Quebec, a two-day conference exploring issues of diversity and inclusion in the Cégep system. The event takes place Wednesday, May 17 to Thursday, May 18, 2017 in Vanier College auditorium (Room A-103, 821 av. Sainte-Croix, Montreal, H4L 3J6). For detailed information click here. CAMP ERIN: Camp Erin® Montreal is a free weekend long bereavement camp for children and teens aged six to 17 experiencing grief from a death of someone close to them. It is a traditional, fun, high-energy camp offering opportunities for grief education, peer bonding and emotional support. Camp Erin Montreal is facilitated by highly trained professionals and compassionate volunteers from The Sylvan Adams YM-YWHA and the Harry Bronfman YCC. It will take place August 11 to 13. For more details call 514-737-6551 ext. 264 or e-mail CampErin@ymywha.com. “Grieving the death of a significant person in one’s life can be such an emotionally challenging experience; if Camp Erin Montreal is able help a child or teen benefit from our free weekend long summer grief camp, we are here to join them on their healing journey,” says Corrie Sirota, clinical director of the camp and someone who knows about this subject firsthand. Her brother died in a car accident when he was 26 years old. This tragedy played a key role in her focusing the attention of her vocation as a soial worker on grief and loss. For a video which previews what the camp is all about click here. FUNDS FOR EMSB: Galileo Adult Education Centre Principal Martina Schiavone represented the EMSB at a press conference where Quebec Liberal Member of the National Assembly and Minister Responsible for Access to Information and the Reform of Democratic Institutions Rita de Santis formally announced special funding for projects in Montreal North. Galileo has received $1.5 million by the government for window replacement; $10,000 for new water fountains, and $220,000 for the resurfacing of walkways; Lester B. Pearson High School received $500,000 for the resurfacing for all three of their parking lots and $70,000 to attend to plumbing needs; Gerald McShane Elementary School obtained a $300,000 allocation for the replacement of interior doors; $250,000 for the renovation of washrooms and $200,000 for new flooring. WAGAR ADULT CENTRE: The EMSB is reaching back into its past with the announcement that a 30 day consultation process will begin with the intention of having the Marymount Adult Education Centre in Côte Saint-Luc renamed the Wagar Adult Education Centre. Wagar High School occupied the Parkhaven Avenue building from 1963 until its closure in 2005. The Marymount Adult Education Centre, which previously shared the premises of the Marymount Academy International on Côte Saint-Luc Road in NDG, relocated to the building in September 2005. The facility also serves as the home of the CARE Centre for adults with disabilitie and John Grant High School for special needs students. JOURNÉE PÉDAGOGIQUE POUR LES PARENTS: Le Comité central de parents de la Commission scolaire English-Montréal organisera une conférence spéciale d’une journée portant sur divers sujets d’intérêt. Cette activité se tiendra le samedi 29 avril, de 8 h 15 à 16 h 15, au Centre d’éducation des adultes Saint-Laurent (2405, place Lafortune) et à l’Académie LaurenHill (campus junior). Ces deux écoles sont sous le même toit. Cette « Journée pédagogique pour les parents » s’adresse à tous les parents dont les enfants fréquentent une école de la CSEM. Les thèmes suivants seront abordés : le programme STIAM (Sciences, Technologies, Ingénierie, Arts et Mathématiques), la citoyenneté numérique, les médias sociaux, la vie des élèves en ligne, les enjeux entourant les transsexuels et la communauté LGBT, le nouveau programme d’éducation sexuelle, l’activité physique, les programmes de mathématiques, les compétences en littératie, la mise en place de routines appropriées pour les jeunes à l’heure du coucher, la démystification du plan d’intervention personnalisé (PIP), élever un enfant ayant des besoins particuliers, aider les jeunes à développer de solides habiletés en communication orale et des compétences précoces en littératie, éliminer le stress dans les écoles primaires, gérer l’anxiété, soutenir les élèves ayant des troubles de motricité fine, protéger les jeunes dans l’univers numérique, le grand débat entourant les devoirs et la formation professionnelle. Les séances seront animées par des professionnels de la CSEM spécialisés dans ces domaines ainsi que d’autres professionnels hautement qualifiés. Cette conférence est organisée par le Comité central de parents de la CSEM, sa présidente Suzanne De Jonge et Norm Gharibian, commissaire-parent. Il n’y a aucuns frais d’inscription. Cette activité s’adresse à tous ceux et celles qui font partie de la grande communauté de la Commission scolaire English-Montréal. Que vous soyez parent, enseignant, bénévole ou parent de futurs élèves, il y en a pour tous les goûts! Inscrivez-vous au http://www.emsb.qc.ca/parentconference; hâtez-vous, les places sont limitées. JOURNÉE NATIONALE DES ENSEIGNANTS: À l’aube de la Journée nationale des enseignants qui aura lieu le 2 mai prochain, la CSEM a décerné à trois enseignants des prix sous forme de cartes-cadeaux chez P.F. Chang’s et La Cage Brasserie sportive. La cérémonie, coparrainée par Breakfast Television de City, s’est déroulée le 26 avril à l’école primaire Roslyn. La CSEM a reçu une foule de mises en candidature dans les trois catégories suivantes : secteur jeunesse, secteur éducation des adultes et secteur de l’éducation physique et de la santé. Tyffany Coryn, directrice de l’accueil chez P.F. Chang’s à Montréal, a remis des cartes-cadeaux d’une valeur de 100 $ à Nancy Latulippe, enseignante à la maternelle à l’école Roslyn, et à Stuart Chappell, enseignant d’anglais au Centre d’éducation des adultes John F. Kennnedy à Saint-Michel, de même qu’une carte-cadeau de 100 $ chez La Cage décernée à Michael Creamer, enseignant d’éducation physique et de santé à l’école primaire Hampstead. AMBASSADEURS DU CHANGEMENT : Quelque 45 élèves de la CSEM se rendront à Ottawa le 8 mai afin d’honorer la mémoire de tous ceux et celles qui ont péri durant l’Holocauste, de même que pour accroître la sensibilisation aux valeurs associées à la diversité, la justice et l’inclusion sociale lors de deux événements : le symposium annuel des ambassadeurs du changement et la cérémonie de la Journée nationale dédiée à la mémoire des victimes de l’Holocauste. Accompagnés de membres du personnel de l’école et d’animateurs de vie spirituelle et d’engagement de vie communautaire, les élèves représenteront l’école secondaire John Grant de Côte-Saint-Luc, l’école secondaire innovatrice Outreach de NDG, l’école secondaire innovatrice Programme Mile End de Côte-des-Neiges et l’Académie LaurenHill de Ville Saint-Laurent. Organisée par la Société canadienne pour Yad Vashem, cette activité d’une journée comportera deux volets. Dans un premier temps, quelque 150 élèves du Québec et de l’Ontario se donneront rendez-vous au Centre national des Arts, de 13 h à 14 h 30, afin de prendre part au symposium annuel des ambassadeurs du changement. Ils participeront à des discussions encadrées où des groupes de 15 élèves seront jumelés à un survivant de l’Holocauste. Ce dernier partagera son expérience personnelle avec son groupe, tandis que les élèves, à l’aide de 15 questions qui leur auront été fournies, dirigeront la discussion sur la pertinence des leçons tirées de l’Holocauste dans le monde actuel, de même que sur ce qu’ils peuvent faire pour contribuer à promouvoir un esprit de tolérance et d’inclusion au sein de leurs propres communautés. L’événement se poursuivra à 15 h 30 au Musée canadien de la guerre pour la cérémonie de la Journée nationale dédiée à la mémoire des victimes de l’Holocauste. Les élèves se joindront à une foule de quelque 600 personnes, notamment des survivants et leurs familles, lors de cette cérémonie qui permet de perpétuer le souvenir de l’Holocauste et des six millions de Juifs qui ont tragiquement péri aux mains des Nazis, et pour inculquer des valeurs de respect à l’égard des droits de l’homme partout dans le monde. Des personnalités et des dignitaires sont attendus à cette cérémonie. Au nombre des invités, mentionnons le premier ministre Justin Trudeau, le maire d’Ottawa Jim Watson, les chefs des principaux partis politiques fédéraux, les membres du Parlement, les sénateurs, les ambassadeurs, les juges de la Cour suprême du Canada et l’ambassadeur du Canada en Israël, Nimrod Barkan, qui prononcera un discours à cette occasion. SENSIBILISATION À LA SANTÉ MENTALE: Pour souligner la Semaine de sensibilisation à la santé mentale (du 1er au 5 mai), le Centre de ressources en santé mentale de la CSEM souhaite souligner l’excellent travail que les élèves accomplissent pour se rapprocher de la nature. C’est là l’occasion pour toutes les écoles de la CSEM de démontrer de quelle façon elles s’y prennent. L’objectif vise à sensibiliser les élèves aux bienfaits de la nature sur le plan de la santé mentale. La science démontre de plus en plus que lorsqu’on apprivoise la nature, en pratiquant des activités en plein air (randonnée, jardinage, etc. ), on en retire un bien-être mental et nos niveaux de stress, d’anxiété et de dépression diminuent. Les élèves sont invités à préparer des présentations PowerPoint, des vidéoclips, des collages, des chansons, des poèmes et des compositions afin de décrire comment leur classe, leur niveau, leur école se rapprochent de la nature. La date limite est le 28 avril. Pour de plus amples renseignements, adressez-vous à cambrosi@emsb.qc.ca. ART ORATOIRE: La compétition annuelle d’art oratoire de la CSEM, rite de passage pour tous les élèves du secondaire, a eu lieu le 19 avril pour les classes de 1re et 2e secondaires et le 21 avril pour les classes de 3e, 4e et 5e secondaires. La compétition s’est déroulée à l’Académie LaurenHill à Saint-Laurent. Les élèves du premier groupe ont prononcé des discours narratifs personnels, tandis que ceux du second groupe ont présenté des discours persuasifs sur des sujets de nature sociale ou politique. Comme par le passé, les gagnants des niveaux inférieurs pourraient avoir l’occasion de présenter leurs discours devant les membres du conseil des commissaires de la CSEM. Cette année, le Cercle canadien des femmes a remis au lauréat de 3e secondaire un séjour d’une semaine toutes dépenses payées à Rencontres du Canada, à Ottawa, et une invitation à prononcer son discours gagnant lors de la réunion de mai. Les lauréats de 4e et 5e secondaires auront la chance de prendre part aux finales du concours oratoire du Club Rotary en mai 2017. LE FRANÇAIS POUR L’AVENIR: L’école FACE a accueilli le 6 avril le forum local de Montréal 2017 du Français pour l’avenir. Sous le thème Respect, culture et intégration à la société québécoise, ce forum annuel vise à promouvoir le bilinguisme parmi les jeunes au Canada. Quelque 500 élèves provenant de huit écoles secondaires de la région de Montréal, de trois commissions scolaires et de deux écoles juives étaient présents. À cette occasion, la fort sympathique comédienne montréalaise, Dorothy Rhau, a agi à titre de maîtresse de cérémonie. FACE est la seule école à appartenir conjointement à la Commission scolaire English-Montréal et à la Commission scolaire de Montréal, ce qui en fait un endroit de prédilection pour la tenue d’un tel forum. Les participants ont assisté à une prestation musicale du groupe NBGN, mettant en vedette RACCOON, et à une présentation spéciale de la part de Maude Morissette, comédienne et créatrice de la série Web primée qui s’intitule La Dump/The Dump. Parmi les autres activités, mentionnons un jeu-questionnaire interactif sur la culture canadienne et québécoise, une jeune troupe francophone de danse contemporaine et hip hop, le studio de danse Urban Element Zone, une version maison de l’émission La Voix présentée sur les ondes de TVA et une grande finale interactive fort attendue mettant en vedette la Ligue d’improvisation montréalaise. Le forum s’est terminé par la remise de superbes prix offerts par des commanditaires locaux (Bureau en gros, HMV, EMPIRE, Renaud Bray, etc.). La Voix a été particulièrement populaire auprès des participants. Angelike Falbo, finaliste ayant terminé deuxième en 2015 et diplômé de l’école secondaire Laurier Macdonald à Ville Saint-Laurent, était accompagné des participants actuels, David Marino et Hanorah. Mentionnons que David est diplômé de l’Académie Leonardo Da Vinci et du Collège Vincent Massey, deux établissements de la CSEM. Le trio a joué les juges, tournant leurs fauteuils de manière à faire dos à la scène tandis qu’une douzaine de braves ont grimpé sur la scène pour interpréter une chanson. Voici les écoles qui ont pris part à cette activité : école secondaire Westmount, Académie Royal West à Montréal-Ouest, Royal Vale à NDG, écoles secondaires Rosemont et FACE de la Commission scolaire English-Montréal (CSEM); Académie Lakeside à Lachine, école Lindsay Place à Pointe-Claire de la Commission scolaire Lester-B.-Pearson; école secondaire Howard S. Billings à Châteauguay de la Commission scolaire New Frontiers; et deux écoles secondaires juives – Bialik et Hebrew Academy. La fondation Strike Out Cancer vise à sensibiliser les gens à ce type de cancer et à offrir du soutien aux individus et aux familles touchés par cette maladie. Le dimanche 28 mai, de 13 h à 19 h, se tiendra la 7e édition annuelle du quille-o-thon StrikeOut Cancer au Centre de quilles 440 situé au 2535, boul. Curé-Labelle à Laval. L’objectif vise à amasser 10 000 $ dans le cadre d’un partenariat avec la Fondation Rêves d’enfants. Cette fois-ci, l’enfant que nous souhaitons aider se prénomme Sophie. Elle est âgée de huit ans et combat un cancer des os. « Nous continuons de déployer des efforts et de gagner du terrain dans le but de venir en aide à notre communauté et de permettre à une autre jeune fille de concrétiser son rêve », a déclaré Anthony, accompagné de ses amis Alessia Ferrara et Damiano Dattilio lors de la tournée des classes. Les billets pour le quille-o-thon sont en vente au prix de 35 $ (adultes) et de 25 $ (enfants de 12 ans et moins).Le prix du billet inclut 3 parties de quilles, la location de chaussures, boissons et nourriture ainsi que des prix de présence. Voici le lien si vous connaissez des gens qui aimeraient faire un don ou acheter des billets :https://cause2give.unxvision.com/P2PWeb/Default.aspx?EventId=1302&LanguageId=1. Ils peuvent également visiter notre site Web à www.strikeoutcancerfund.org. UNE ENSEIGNANTE DE LA CSEM REMPORTE L’ÉLECTION PARTIELLE FÉDÉRALE : Dans ce que les experts politiques décrivent comme une étonnante victoire, Emmanuella Lambropoulos, enseignante à l’école secondaire Rosemont, a remporté l’investiture du Parti libéral dans la circonscription fédérale de Saint-Laurent–Cartierville, défaisant ainsi Yolande James, ex-membre de l’Assemblée nationale et ministre du cabinet québécois, ainsi que Mawhra Rizqy. TROTTIBUS VOIT LE JOUR: Le vendredi 5 mai, à 8 h 55, l’école Willingdon lancera le programme Trottibus, une initiative de la Société canadienne du cancer. Cet autobus pédestre permet aux élèves d’écoles primaires de marcher jusqu’à l’école en toute sécurité en empruntant des trajets planifiés et sous la supervision de bénévoles sélectionnés. Les élèves profiteront ainsi des bienfaits de la marche plutôt que de prendre l’autobus scolaire. Outre les avantages physiques de cette initiative, mentionnons une baisse de circulation autour des écoles, la sécurité accrue des piétons et une diminution de la pollution. L’école Willingdon deviendra la deuxième école de la CSEM, après l’école Dunrae Gardens de Ville-Mont-Royal, à participer au programme Trottibus. Lara Belinsky, enseignante d’éducation physique et de santé, de même qu’un groupe de parents dévoués ont travaillé d’arrache-pied pour mettre en branle Trottibus à l’école Willingdon. Deux trajets seront offerts les vendredis matins seulement, pour le moment. Ceux qui souhaitent participer à ce programme doivent visiter le http://www.trottibus.ca/en/participate. La Société canadienne du cancer a mis sur pied le programme Trottibus il y a six ans, pour diverses raisons, notamment pour accroître le niveau d’activité physique sur une base quotidienne, abaisser les risques de cancer, diminuer la circulation aux abords des écoles, contribuer à des communautés plus écologiques, et plus encore. On peut lire sur le site Web de la Société canadienne du cancer qu’il est possible de prévenir environ la moitié de tous les cas de cancers en adoptant un mode de vie sain et en mettant en œuvre des politiques visant à protéger la santé publique. De plus, on dit que pour chaque kilomètre parcouru à pied chaque jour, les risques d’obésité diminuent de cinq pour cent. LLOYD BARKER, CONFÉRENCIER MOTIVATEUR: Ex-capitaine adjoint de l’Impact de Montréal, joueur le plus utile de son équipe, joueur étoile de la ligue et ancien entraîneur-adjoint, Lloyd Barker visite des écoles à titre de conférencier motivateur. Ses exposés s’adressent aux élèves âgés de huit ans et plus. Il offre ses services à titre gratuit. En retour, il demande simplement que l’école distribue aux élèves présents des dépliants de sa nouvelle académie de soccer. Ses présentations portent à la fois sur des thèmes de motivation (persévérance, appréciation, etc. ), sur l’importance de ne pas abandonner l’école, de même que sur l’entraînement et le bien-être. La durée de la présentation est de 60 à 75 minutes. Il suggère aux écoles de regrouper les groupes dans le gymnase pour la présentation. Il anime les présentations en matinée, de préférence. L’académie de soccer Barker Elite Soccer Training enseigne habilement aux joueurs chacune des techniques de base essentielles au soccer pour leur permettre de s’améliorer sur le plan technique et d’exécuter parfaitement les diverses habilités, et ce, de façon constante. Lors de l’enseignement des diverses techniques, on explique aux joueurs exactement le rôle de chacune d’entre elles sur le plan tactique durant les matchs. Les programmes d’entraînement sont conçus de manière à s’adapter individuellement à chaque joueur et s’inspirent du modèle Développement à long terme du joueur et phases de développement de l’Association canadienne de soccer. En limitant à quatre le nombre de joueurs de chaque groupe assignés à nos entraîneurs expérimentés, les joueurs profitent d’une attention individuelle à chaque séance d’entraînement. Pour en savoir davantage sur son académie, visitez le www.best11academy.com. SOIRÉE DES BÉNÉVOLES: La Soirée annuelle d’appréciation des parents bénévoles à la CSEM, commanditée par les Services financiers La Capitale, a eu lieu le mardi 4 avril à l’Hôtel Crowne Plaza, sur le chemin de la Côte-de-Liesse. L’édition de cette année visait à commémorer la Semaine de l’action bénévole qui s’est déroulée du 16 au 22 avril, sous le thème « Bénévoles : Créateurs de richesses ». À l’occasion des festivités du 375e de Montréal, le maire Denis Coderre a prononcé le discours d’ouverture. Anthony Calvillo, joueur de football légendaire qui a connu une carrière fulgurante en tant que quart arrière des Alouettes de Montréal, où il occupe maintenant le poste d’entraîneur adjoint, a reçu le tout premier prix Ambassadeur bénévole de l’année de la CSEM. Les deux enfants d’Anthony et de son épouse Alexia fréquentent l’école primaire Gardenview à Saint-Laurent. Au cours des deux dernières décennies, Anthony a gracieusement visité des écoles et véhiculé son message de persévérance scolaire aux élèves. Cette année, les Bénévoles émérites sont Rosario Guzzo et sa défunte épouse Rosa de l’école primaire internationale Michelangelo à Rivière-des-Prairies. Rosa est décédée en janvier. Rosario et son fils étaient présents pour recevoir cet honneur en son nom. Faute de temps et d’espace, la CSEM n’a pas pu honorer en personne ses quelque 1 500 bénévoles. Par conséquent, seuls ceux qui œuvrent à titre de bénévoles depuis plus de cinq ans ont été conviés à cette réception, soit environ 500 personnes. Toutefois, plusieurs milliers d’exemplaires du programme commémoratif seront distribués dans toutes les écoles. Jamie Orchard, chef d’antenne à Global News, et Michael Cohen, spécialiste en communications et marketing à la CSEM ont été les maîtres de cérémonie de la soirée. Pour la 8e année consécutive, les Services financiers La Capitale était le commanditaire principal de l’événement. Les Services financiers La Capitale (www.lacapitale.com), membre du Groupe financier La Capitale, offre une vaste gamme de produits et services conçus pour simplifier les choix financiers des membres qui œuvrent dans les secteurs publics et parapublics, dans plus de 900 institutions à la grandeur de la province. Au nombre des services offerts figurent les conseils financiers personnels, l’épargne, les placements, l’assurance vie et santé, les hypothèques et prêts personnels, l’assurance automobile et l’assurance pour véhicules récréatifs, l’assurance habitation, l’assurance voyage et la protection juridique, l’assurance commerciale et l’assurance collective. QUÊTE SPIRITUELLE: Le jeudi 20 avril, les animateurs de vie spirituelle et d’engagement communautaire (AVSEC) et les élèves de la CSEM ont pris part à une activité qui les a amenés à visiter des sites spirituels sacrés et à faire preuve de compassion afin de développer une plus grande conscience spirituelle. Selon les traditions des Premières Nations, la quête spirituelle peut mener à un changement intérieur, une guérison, une ouverture vers les autres et vers le divin. Lors du lancement de l’activité Quête spirituelle, plusieurs liens seront créés avec le Jour de la Terre, notamment la célébration des traditions des Premières Nations pour protéger la planète et veiller au bien-être de chacun. Cette troisième Quête spirituelle organisée par les AVSEC de la CSEM visait 12 établissements : l’école secondaire John F. Kennedy à Saint-Michel, l’école secondaire John Paul I à Saint-Léonard, l’école secondaire Laurier Macdonald à Saint-Léonard, l’école secondaire Lester B. Pearson à Montréal-Nord, l’Académie LaurenHill (junior et senior) à Ville Saint-Laurent, l’Académie internationale Marymount à Montréal, l’école secondaire Rosemont à Rosemont, l’école secondaire Royal Vale à NDG, l’Académie Royal West à Montréal-Ouest, le Collège Vincent Massey à Rosemont et l’école secondaire Westmount à Westmount. Les équipes participant à la Quête spirituelle ont débuté leur périple d’un jour au centre administratif de la CSEM situé au 6000, avenue Fielding à NDG, dès 8 h 30 et cette activité s’est terminée en milieu d’après-midi au lac aux Castors sur le Mont-Royal. Les élèves devaient prendre des photos, réunir de l’information et se sentir inspirés à redonner à leur communauté. Au nombre des activités accomplies, mentionnons : visiter et honorer des sites sacrés et se renseigner sur l’histoire des différentes communautés culturelles et confessions religieuses à Montréal, visiter le Mont-Royal pour un moment de réflexion et partager nos espaces verts et en prendre soin. L’un des objectifs des AVSEC vise à aider et à encourager les élèves à se montrer au meilleur d’eux-mêmes et à exprimer leurs propres vertus positives et traits de caractère. Il s’agit du « Programme des vertus ». Ce programme est dispensé par les AVSEC et constitue le fondement de la Quête spirituelle qui se veut une journée vers une meilleure compréhension de soi. Chaque équipe était composée de tout au plus 6 élèves âgés de 12 à 16 ans et d’un AVSEC. À l’aide d’indices, ils se sont déplacés d’un endroit à l’autre, à pied ou en empruntant le transport en commun écoresponsable, et ont dû relever en route des défis de nature spirituelle. Cette activité permet aux élèves de visiter des sites civiques, historiques, spirituels et d’organismes communautaires tout en tirant une expérience personnelle leur permettant de développer des vertus positives et des traits de caractère, de resserrer les liens entre les écoles et la communauté, ainsi que leur relation étroite avec la Terre et leur propre spiritualité. DU FINANCEMENT POUR LA CSEM: La directrice du Centre d’éducation des adultes Galileo, Martina Schiavone, a représenté la CSEM lors d’une conférence de presse où Mme Rita de Santis, députée libérale de l’Assemblée nationale et ministre de l’Accès à l’information et de la Réforme des institutions démocratiques, a annoncé officiellement l’octroi de financement spécial pour des projets à Montréal-Nord. Ainsi, le Centre Galileo a reçu 1,5 million de dollars du gouvernement pour le remplacement de fenêtres; 10 000 $ pour de nouvelles fontaines et 220 000 $ pour la réfection des allées piétonnières. Pour sa part, l’école secondaire Lester B. Pearson a obtenu 500 000 $ pour la réfection de ses trois terrains de stationnement et 70 000 $ pour exécuter des travaux de plomberie. Enfin, l’école primaire Gerald McShane a reçu une allocation de 300 000 $ pour le remplacement de portes intérieures, 250 000 $ pour la rénovation des toilettes et 200 000 $ pour le remplacement des revêtements de sol. REPORTAGE DE RADIO CANADA: L'agence fédérale propose de diminuer les concentrations de plomb dans l'eau potable et d'accentuer la surveillance de ce métal dans les robinets des écoles et garderies. Santé Canada propose de réduire de moitié la concentration maximale de plomb dans l’eau potable, pour la faire passer de 10 à 5 microgrammes par litre. Il s’agit d’un des plus bas niveaux à l’échelle internationale. L’agence fédérale propose aussi de vérifier la teneur totale en plomb dans l’eau des écoles et des garderies au moins une fois par année. Les provinces pourraient ainsi être appelées à inspecter toutes les fontaines d’eau potable et tous les robinets d’eau froide utilisés pour la consommation ou la préparation d’aliments. Santé Canada a fait ces recommandations dans le cadre de consultations publiques sur la question. La Commission scolaire English-Montréal (CSEM) a entrepris des travaux pour améliorer la qualité de l’eau consommée par ses élèves. La CSEM s’est lancée dans le remplacement de toutes les fontaines de ses écoles. Au total, près de 600 nouvelles fontaines seront installées. La majorité sera munie d'une cartouche filtrante pour bloquer les substances indésirables. Le directeur du Service des ressources matérielles, Daniel Hogue, souligne que les nouveaux dispositifs permettent de réduire significativement les concentrations de plomb, de chlore et de particules dans l’eau. Coût des travaux : 2 millions de dollars. La chercheuse Évelyne Doré, de l’École Polytechnique de Montréal, a analysé l’eau provenant de 71 robinets et fontaines de sept écoles au Québec. Les échantillons recueillis après cinq minutes d’écoulement étaient conformes à la concentration maximale acceptable en vigueur. En revanche, la moitié des échantillons recueillis dès l’ouverture du robinet ou de la fontaine dépassaient la recommandation de 10 microgrammes par litre de Santé Canada. Pour visionner le reportage télé : https://vimeo.com/213694304. REPORTAGE DE RADIO CANADA : L'agence fédérale propose de diminuer les concentrations de plomb dans l'eau potable et d'accentuer la surveillance de ce métal dans les robinets des écoles et garderies. Santé Canada propose de réduire de moitié la concentration maximale de plomb dans l’eau potable, pour la faire passer de 10 à 5 microgrammes par litre. Il s’agit d’un des plus bas niveaux à l’échelle internationale. L’agence fédérale propose aussi de vérifier la teneur totale en plomb dans l’eau des écoles et des garderies au moins une fois par année. Les provinces pourraient ainsi être appelées à inspecter toutes les fontaines d’eau potable et tous les robinets d’eau froide utilisés pour la consommation ou la préparation d’aliments.Santé Canada a fait ces recommandations dans le cadre de consultations publiques sur la question. La Commission scolaire English Montreal (CSEM) a entrepris des travaux pour améliorer la qualité de l’eau consommée par ses élèves. La CSEM s’est lancée dans le remplacement de toutes les fontaines de ses écoles. Au total, près de 600 nouvelles fontaines seront installées. La majorité sera munie d'une cartouche filtrante pour bloquer les substances indésirables. Le directeur du service des ressources matérielles, Daniel Hogue, souligne que les nouveaux dispositifs permettent de réduire significativement les concentrations de plomb, de chlore et de particules dans l’eau. Coût des travaux : 2 millions de dollars.La chercheuse Évelyne Doré, de l’École Polytechnique de Montréal, a analysé l’eau provenant de 71 robinets et fontaines de sept écoles au Québec.Les échantillons recueillis après cinq minutes d’écoulement étaient conformes à la concentration maximale acceptable en vigueur.En revanche, la moitié des échantillons recueillis dès l’ouverture du robinet ou de la fontaine dépassaient la recommandation de 10 microgrammes par litre de Santé Canada. The next Focus will be published on May 25. Submissions should be made to Michael J. Cohen preferably by e-mail (mcohen@emsb.qc.ca) by May 19at Noon.